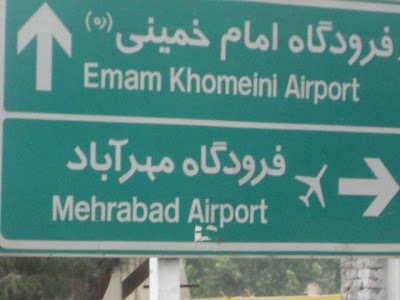 We took Iran Air (cost RM 2942 = KL-Tehran-KL + domestic flights to Esfahan and Shiraz). 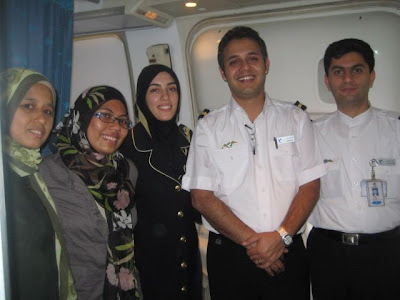 Their fleets are quite old, but we enjoyed our flight anyway :- ) Raph is a very chatty man, so we ended up taking pictures with the steward/ess(es), and one of them invited us to his home in Tehran. 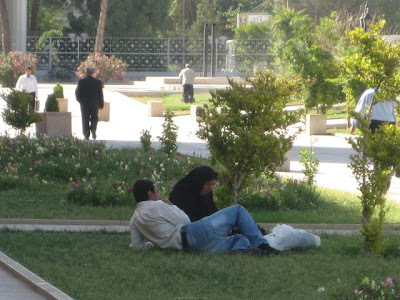 Iranians like to do this – they like to invite visitors to their homes. What a friendly lot! 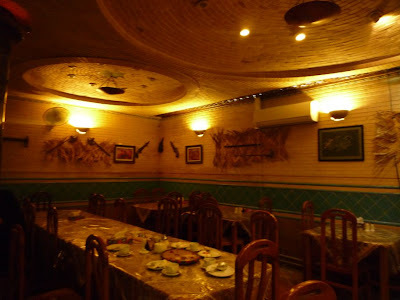 We arrived Shiraz close to midnight, and Raph’s friend – Hamed fetched us from the airport. Hamed has been offered a scholarship to pursue his pHD in Msia. I wish him all the best. Entrance only cost Iran Riyal 5000 (or RM1.80) It was really hot when we reached there –38C! 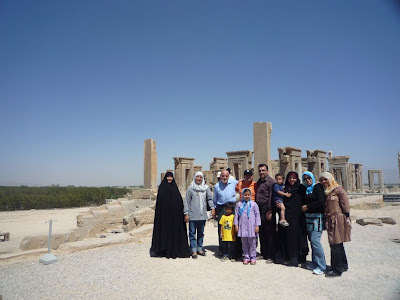 This was our Kerja Gila #1 : climbing the ruins of the Achaemenid empire, built about 2500 years ago! 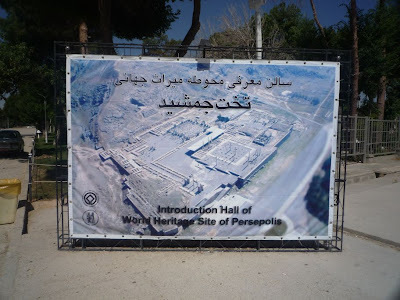 Cyrus the Great chose the site of Persepolis, but Darius the Great built the terrace and the great palaces. 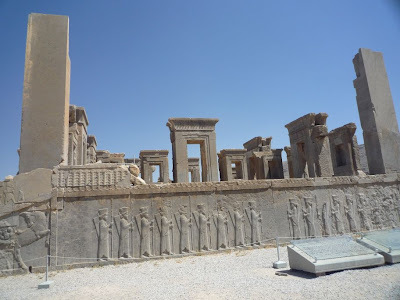 Darius ordered the construction of the Apadana Palace and the Council Hall (the Tripylon or three-gated hall), the main imperial Treasury and its surroundings. 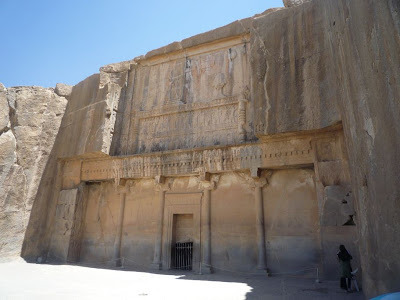 These were completed during the reign of his son, King Xerxes the Great. 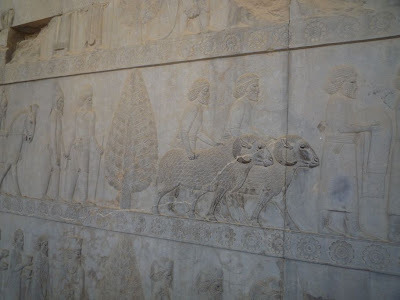 Further construction of the buildings on the terrace continued until the downfall of the Achaemenid dynasty. 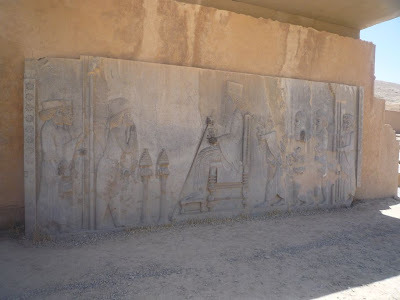 It was a marvel to see their works and technology from an ancient civilization. 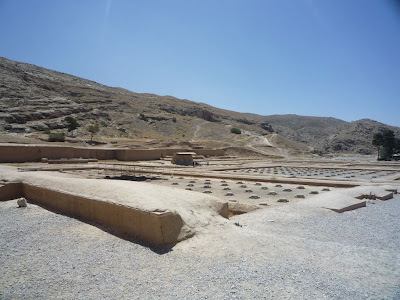 They even had a treasury – or bank here. It’s probably the first bank in the world. The Achamenids later conquered the Mesopotamia empire in ancient Iraq (Tigris and Euphrates river) and even expanded their empire to Egypt. 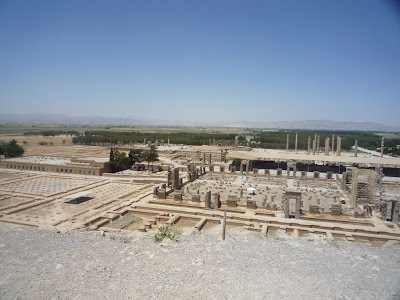 Here at Persepolis, they had a convention, an ancient United Nations convention where they had delegations from other nations. We sought respite from the sweltering heat with the delicious home made Iranian ice cream and Iranian slurpee. Slurp slurp indeed : ) We went into the souvenir shop for a while and saw that the staff there have blue eyes! Iranians are descendants of the Aryan people. 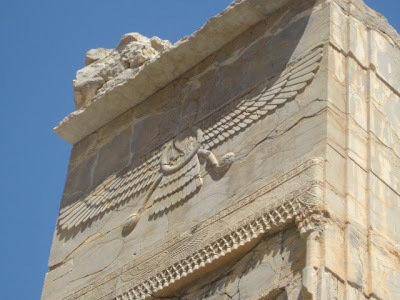 The term Aryan originates with the Indo Iranian self-designation arya, attested in the ancient texts of Hinduism (the Rigveda) and Zoroastrianism (the Avesta). 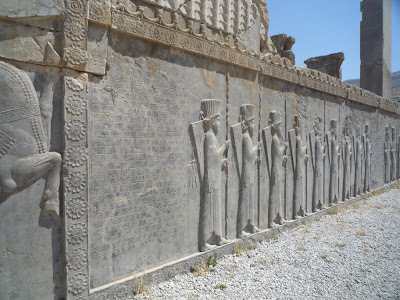 The word Aryan was adopted to refer not only to the Indo-Iranian people, but also to native Indo-European speakers as a whole, including the Albanians, Armenians, Greeks, Latins and Germans. 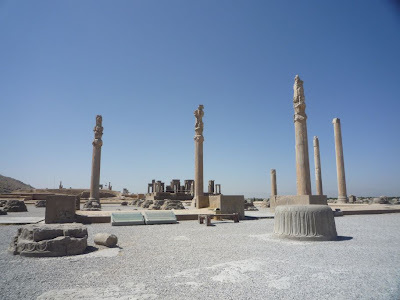 It was argued that all of their languages originated from a common root — now known as Proto-Indo-Europeans — spoken by an ancient people who must have been the original ancestors of the European, Iranian and Indo-Aryan peoples. The ethnic group composed of the Proto-Indo-Europeans and their modern descendants was termed the Aryans. That explains the blue eyes. 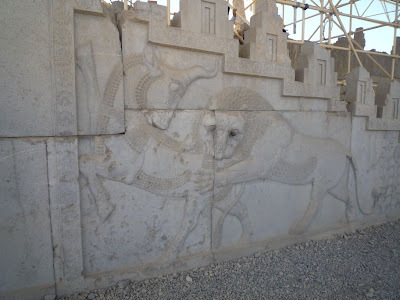 Anyway, we then proceeded to Naqsh-e-Rostam, but we didn’t go in, just took pictures from outside. 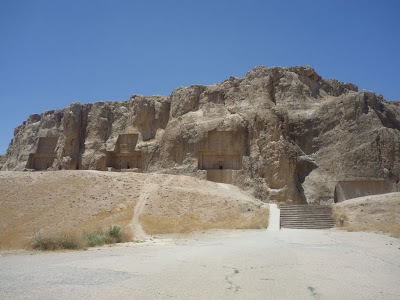 It is the tombs of Darius I (r. 522-486 BCE), Xerxes I (r. 486-465 BCE), Artaxerxes I (r. 465-424 BCE) and Darius II (r. 423-404 BCE). 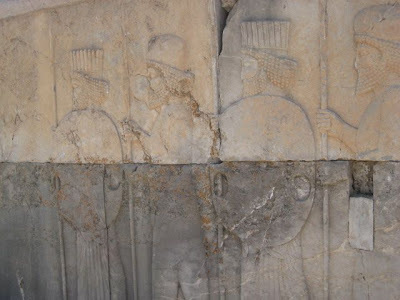 A fifth unfinished one might be that of Artaxerxes III, who reigned at the longest two years, but is more likely that of Darius III (r. 336-330 BCE), last of the Achaemenid dynasts. 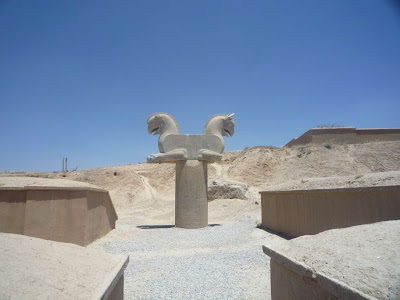 The tombs were looted following the conquest of the Achaemenid empire by Alexander the Great.